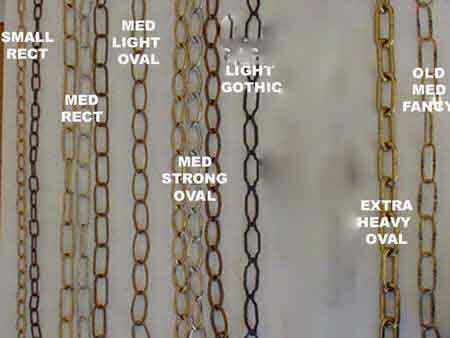 Our chains are made of steel and plated in either brass, florentine bronze or chrome. We also stock a selection of black steel chains. 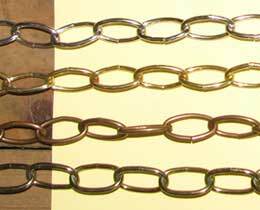 The only SOLID BRASS chain that we have has a very small rectangular 20mm length link. This chain has quite a small link. Can hang small 3 chain shades. We recommend to hang heavier single lights; heavier chandeliers etc. Each link of this chain can be unscrewed. Generally to hang smaller, not heavy looking shades. Also for hanging larger 3 chain shades.